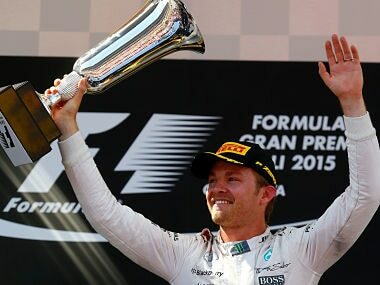 Mercedes' Nico Rosberg drove a superb race under crazy amounts of pressure. 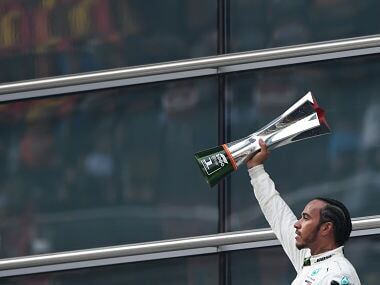 However if he had he not won today, his title chances would have been non-existant. Lewis Hamilton leads the driver’s championship by 20 points on 111, with Rosberg on 91 and Vettel on 80. Next race is in two weeks’ time at the Monaco Grand Prix. Thanks for joining me. See you then! Engineer: "Looks like it is a big ask to do it, so maybe better to consolidate the position." Lewis Hamilton: "If you are saying it is not possible let me know." Engineer: "Yeah I don't think it would be possible with the remaining laps, we'd be better just looking after this one, let him have it." Hamilton: "Is it impossible is what I'm asking?" Five laps to go! Top 10: Rosberg, Vettel, Hamilton, Bottas, Raikkonen, Massa, Ricciardo, Grosjean, Kvyat, Verstappen. Lap 59: Hamilton asks his team if he can win and Mercedes tell him it’s best to consolidate second place, but Hamilton wants to know if it’s possible to catch Rosberg. He’s told the gap’s too big. However he doesn't take no for an answer, manages to reduce another second off Rosberg’s lead – it’s now 15 seconds, but he’s slowly running out of laps. Sebastian Vettel: "Come on, blue flag! Otherwise I get stuck." Lap 52: It's now Vettel's turn to get impatient, complaining over the team radio that traffic has held him up repeatedly. Meanwhile, there’s some action between Bottas and Raikkonen, both chasing fourth place. Rosberg leads the race. It's box, box, box for Hamilton!!! Lap 50: The top ten is as follows: Hamilton, Rosberg, Vettel, Bottas, Raikkonen, Massa, Ricciardo, Grosjean, Kvyat, Verstappen. Another Pitstop for Lewis Hamilton? Wouldn’t it be something if Lewis could make these tyres last? It would be called fiction. Another retirement. Race over for Lotus' Pastor Maldonado. Lap 41: Vettel has another amazing pit stop, and gets out ahead of team-mate Raikkonen, but he’s fourth. Hamilton returns to where he started- in second, and is now moving faster than leader Rosberg. Could he overtake his team-mate? Lap 36: Only Raikkonen, of the current top six, is still going for a two-stop race – which means Vettel and Bottas will need to come in to the pits twice more. However that fastest lap from Hamilton – 1:29.910, no less – has the Ferrari paddock puzzled. Lap 34: Hamilton and Raikkonen both battling hard, and both on hard tyres, battling for fourth. Hamilton manages to slip stream past the Finn, and will now go after Bottas to regain third. Lap 30: Top ten: Rosberg, Vettel, Hamilton, Bottas, Raikkonen, Massa, Ricciardo, Grosjean, Kvyat, Verstappen. Sad day for the Mclaren Honda team. Poor, poor Fernando Alonso. Possible brake failure for Alonso? He's overshot his pit box by some margin! Alonso: “I have problems with brakes”. You think? Lap 22: Daniil Kvyat and Max Verstappen battling it out, the Red Bull however manages to get in front of the Toro Rosso, who moves across, and almost collides with Kvyat. Close call, there. Lewis Hamilton is starting to get a little frustrated, judging by his latest comment over team radio. "Please, Bono [Peter Bonnington], please try not to speak to me in the corners please," he says. Lap 20: Hamilton is again breathing down Vettel’s neck, and he has a small chance to overtake on the straight, but Vettel holds him off. With DRS, not to mention a better car, it seems a matter of time at the moment. Harsh words exchanged between Hamilton and the Mercedes team. They tell him to up the pace and reel Vettel back in, he responds with a curt reminder that it’s not possible. Then tells them to stop talking to him during corners. Clearly, Hamilton woke up on the wrong side of the bed today. 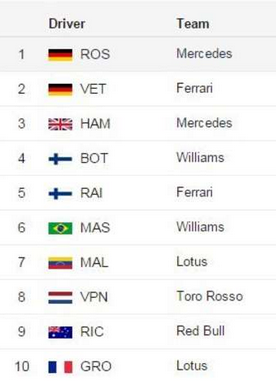 Here’s the current top ten: Rosberg, Vettel, Hamilton, Bottas, Raikkonen, Massa, Alonso, Ericsson, Perez, Ricciardo. Lewis Hamilton is in the pits, but it’s an absolutely horrible pit stop, and Hamilton is outpitted by Maldonado! Comes out of the pits at seventh on the grid, although not for long, just about five corners, before he manoeuvres around the Venezuelan. Here are the top ten so far. Lap 9: Plan B for Hamilton to try and get past Vettel on a three stop strategy; that’s going to be the current champion’s immediate focus, so Rosberg now has everything going his way out in front. He has a six second lead over Vettel now. Uh oh, it seems Lewis Hamilton might be in trouble. Meanwhile his teammate Nico Rosberg is running away with the lead in P1. Your top ten right now are Rosberg, Vettel, Hamilton, Bottas, Raikkonen, Massa, Verstappen, Maldonado, Ricciardo, Sainz. Strong starts for Vettel, Raikkonen and Massa. Is it going to be another Mercedes dominated race? Felipe Massa is on the move and attcking the Toro Rosso's now. Carlos Sainz is under attack from the F1 heavyweights. 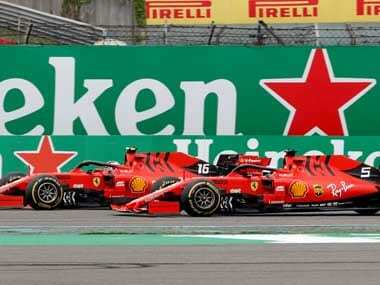 Kimi Raikkonen passes him with complete ease and Felipe Massa also overtakes him just before Turn One and the Spaniard in his home race is down to eighth. And the five red lights go out an the Spanish GP is underway!! Just 10 minutes until the start of the Spanish Grand Prix. Will it be a Mercedes 1-2 once again? Hello and welcome to today's Spanish Grand Prix coverage. Nico Rosberg will go for his first win of the season from pole position at the Spanish Grand Prix on Sunday after finally ending teammate Lewis Hamilton's run of four consecutive poles in qualifying. Rosberg, runner-up to Hamilton in Formula One last year, had the fastest time in two of the three practice sessions, and carried that form with a dynamic drive in qualifying. The German finished 0.267 seconds clear of Hamilton, and 0.777 ahead of Ferrari's Sebastian Vettel. "Awesome, thanks guys" Rosberg told his Mercedes team over the race radio. He gave both thumbs up as he climbed out of his car. His previous pole came at the season-ending Abu Dhabi GP last year. His last victory came at the previous race, the Brazilian GP, where he started from pole. "Psychologically, it feels great. Starting with the car I have I will be trying for the win for sure," said Rosberg, who will try for a ninth career race victory. "Strategy is going to be important. Overtaking is more difficult on this track, so starting in front is a particularly big advantage." Hamilton leads Rosberg by 27 points, and Vettel by 28 in the overall standings. But a strong performance here and in two weeks' time in Monaco would get Rosberg back firmly in contention, especially on tracks where overtaking is notoriously tough. Of the past 24 races at the Catalunya track, 18 have been won from pole — a fact not lost on Hamilton, who took the victory here last year after starting up front. "It is very, very difficult to overtake, as it has been shown over the years," the two-time F1 champion said. "Nico did a great job." However, with more than 700 meters until the first turn, Hamilton can get ahead of Rosberg if he makes a strong start. "It's really about getting down the inside off the line," said Hamilton, who had problems with the rear balance of his car during practice and qualifying. "We have the exact same clutches so naturally we should have the same start. If I'm fresher and have a slightly better reaction (time), it might make a difference." Rosberg drove aggressively from the outset, even beating Hamilton's pole position time from last year in the third practice run. 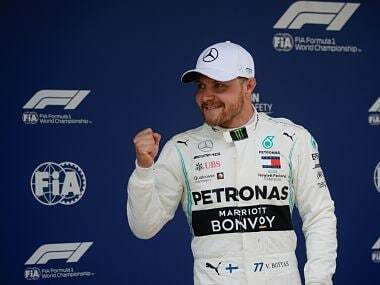 He was keen to make amends for the Bahrain GP three weeks ago, when by his own admission he drove too conservatively in qualifying to protect his tires, and ended up third on the grid behind Vettel and Hamilton. "For sure, Bahrain was still in my mind," he said. "I wanted to make sure I didn't make that mistake again. I just got myself into a rhythm and it worked out well." Vettel, who beat Hamilton in Malaysia, will need a strong performance to challenge the Mercedes cars on Sunday. 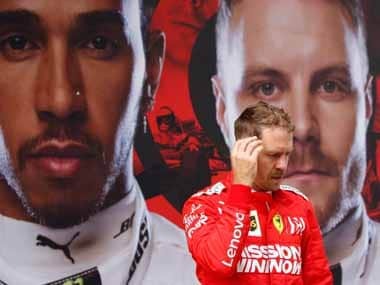 "We would have loved to be a little closer," Vettel said. "I hope it will be better in the race." The last Spanish driver to win here was Fernando Alonso two years ago, and he has all but no chance of even a podium after qualifying down in 13th ahead of McLaren teammate Jenson Button. McLaren, which has struggled since switching to Honda engines, has not scored a point yet this season, with Alonso's best a meager 11th place in Bahrain. But home fans still had something to cheer about with Toro Rosso driver Carlos Sainz Jr. — the son of two-time world rally champion Carlos Sainz — qualifying in fifth place behind the Williams of Valtteri Bottas, and ahead of his Toro Rosso teammate Max Verstappen. The 17-year-old Verstappen starts ahead of 35-year-old Kimi Raikkonen, who was seventh for Ferrari. "Today, I was still struggling, for some reason my car was sliding around," Raikkonen said. "I had not much grip and did a bad lap. It's one of those weekends in which things keep going a little bit wrong here and there, and today we also lost one set of medium tires because of a burning of a blanket."